About the Survey: This salary was administered in May 2017 to data, analytics, and technology practitioners in progressive politics. 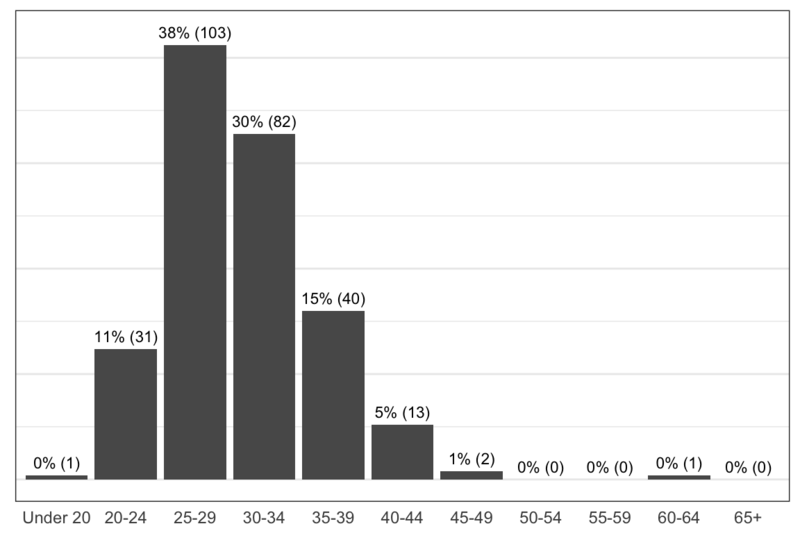 There were 273 respondents (comparable to the 266 respondents in 2016) recruited using snowball sampling: the survey was announced on a few major progressive data e-mail listservs, and readers were encouraged to share the survey around their offices. See Notes for more information about who was eligible. Thank you to everyone who participated in or distributed this survey! About Respondents: Respondents were 56% men and 76% white with a median age of 25-29. Half of all respondents live in the Washington, DC area. 92% of all respondents have a bachelor’s degree or above, and 68% earned their highest degree in the social sciences. Respondents were evenly distributed across analytics/polling firms, issue or advocacy organizations, and labor unions. 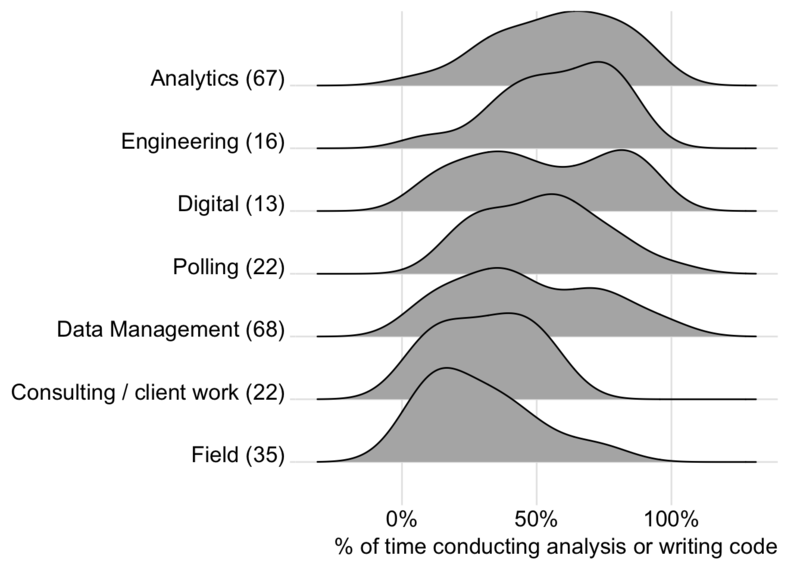 Most respondents work in the fields of general data management or analytics. 37% of all respondents were managers, but this varies dramatically by gender: only 28% of women but 43% of men were managers. The likelihood of being a manager does not meaningfully vary between white respondents and people of color. Non-whites had a lower median salary at $65,000 to $69,000 versus $75,000 to $79,000 for whites. This gap persists across years of experience. Men and women had the same median salary at $70,000 to $74,999. Entry-level employees had a median salary of $55,000 to $59,999; mid-level employees $65,000 to $69,999; and senior / department-head employees $90,000 to $94,999. Non-managers had a median salary of $65,000 to $69,999 while managers of 1-4 staffers made $20,000 more. 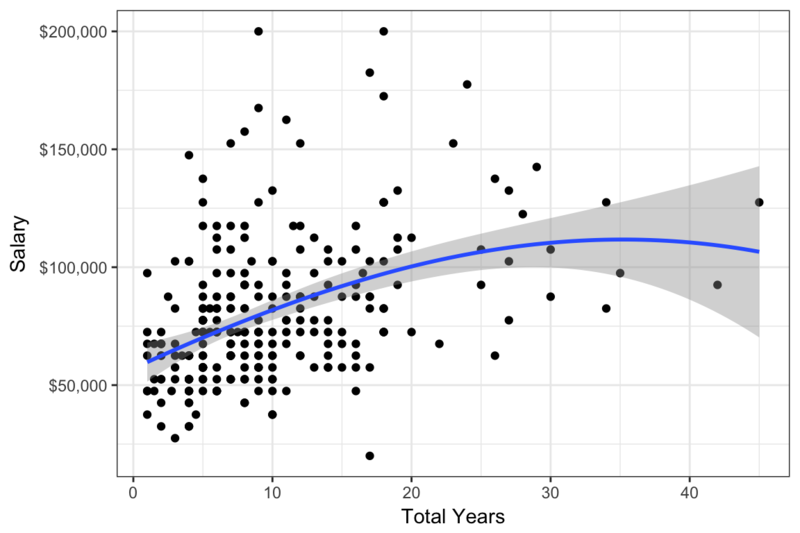 Bachelor’s and Master’s degree holders make roughly the same amount, but PhD-holders (albeit a small sample) make substantially more. 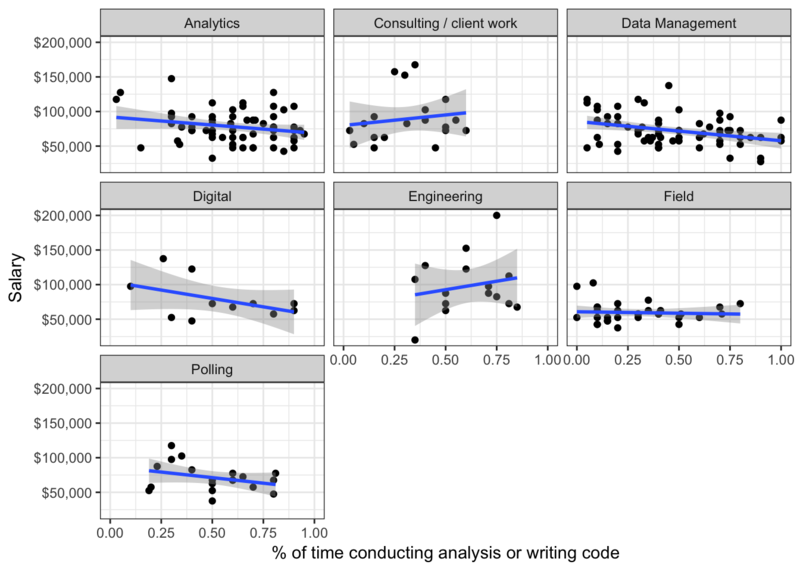 In most fields, the percent of time spent writing code is uncorrelated with salary, and indeed, most technical skills are not correlated with increases in salary. 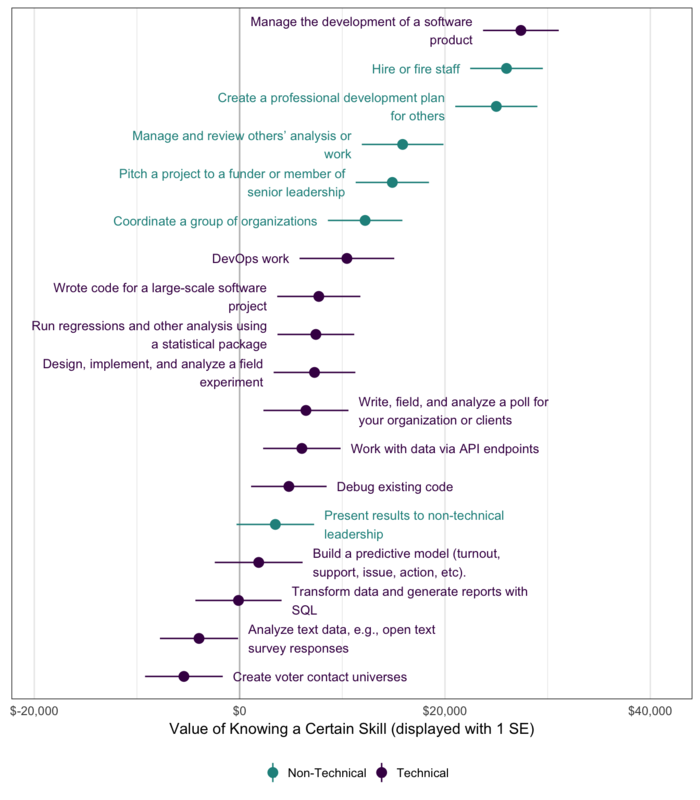 However, engineers appear to make more (with a median of $85,000 to $89,999) than those working in data management ($70,000 to $74,999) or analytics ($75,000 to $79,999). Negotiation: About half of all respondents who were eligible to negotiate a salary did so, and of those who did, 73% increased their compensation at a median rate of 5-10% increase over base. Women were slightly more likely than men to negotiate, but of those who increased their compensation, 48% of men negotiated salary increases of 10%+ while only 31% of women did the same. 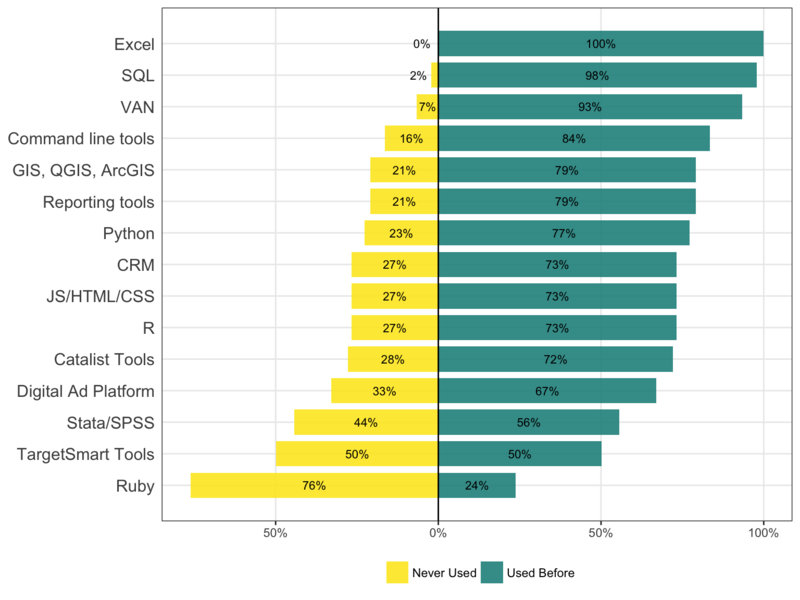 Tools: The most commonly used tools are Excel, SQL, and VAN with 90%+ of respondents reporting that they had used each at least once. Most tools are learned outside of school, either on the job or through other means. Men were substantially more likely than women to rate themselves as intermediate / advanced users. 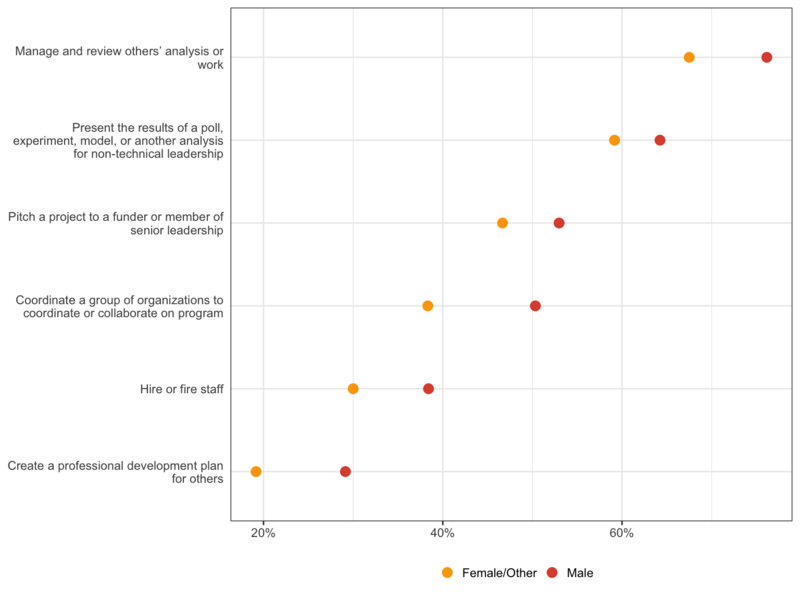 However, the gender gap narrows substantially when looking at often people use those skills. Skills: The most commonly used skills are transforming data and generating reports in SQL; managing and reviewing others’ analysis or work; creating voter contact universes; presenting analyses to non-technical staff; debugging code; pitching projects; and coordinating groups. Fewer than half of respondents reported running regressions, and only 25% reported building a predictive model. Career Plans: About half of respondents plan on staying at the same organization for the next year, and 19% reported a desire to leave politics. 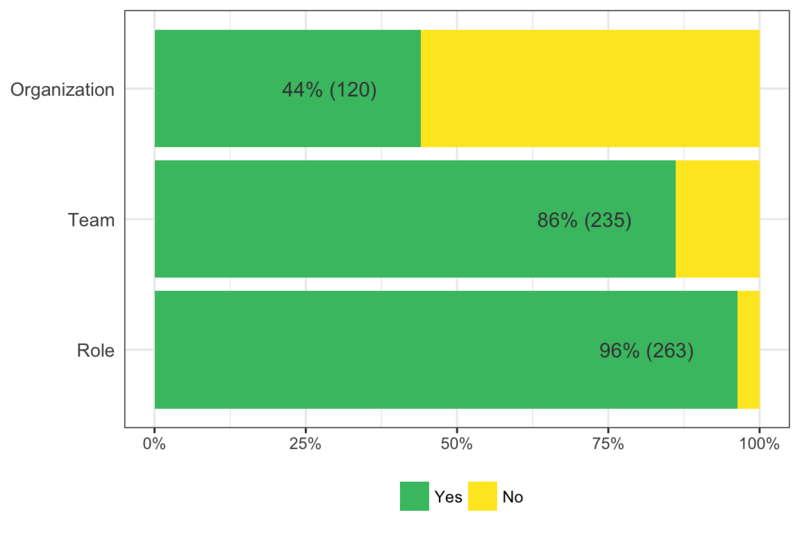 Asked where they expected to be working a year from now, 40% of respondents indicated interest in a political campaign (only 10% of respondents currently work on a political campaign). When asked about the next step in their career, 57% of respondents wanted to learn new skills while 45% wanted to move into management. Respondents diverged on the single organization they would be most excited to work at with 40% of respondents opting to not respond at all. Of the 161 respondents who did respond, Civis Analytics ranked #1 with 15 votes (9%), followed by the Analyst Institute, BlueLabs, and the DNC. For context, last year’s salary survey was 52% Female, 47% Male, and 1% Other. In all subsequent analyses, trans* were coded as male / female. What is your race / ethnicity? Please select all that apply. For context, last year’s salary survey was also about 75% white. Note: Respondents who selected multiple racial categories are coded here as “Multi-Racial”. Age was not asked in last year’s salary survey. Do you consider yourself to be …? Other locations with one respondent were Allentown-Bethlehem-Easton, PA-NJ; Atlanta-Sandy Springs-Roswell, GA; Augusta-Waterville, ME; Bangor, ME; Bremerton-Silverdale, WA; Burlington-South Burlington, VT; Columbia, SC; Detroit-Warren-Dearborn, MI; Glenwood Springs, CO; Green Bay, WI; Houston-The Woodlands-Sugar Land, TX; Kansas City, MO-KS; Little Rock-North Little Rock-Conway, AR; Louisville/Jefferson County, KY-IN; Miami-Fort Lauderdale-West Palm Beach, FL; Missoula, MT; Phoenix-Mesa-Scottsdale, AZ; Raleigh, NC; San Diego-Carlsbad, CA; San Jose-Sunnyvale-Santa Clara, CA; Santa Rosa, CA; Tallahassee, FL; Tucson, AZ. For more on education, take a look at the Appendix. Other responses included working full-time at one job with freelance work and doing full-time corporate work with side work in progressive politics. Is the primary focus (>40% of resources) of your organization data, analytics, or technology? 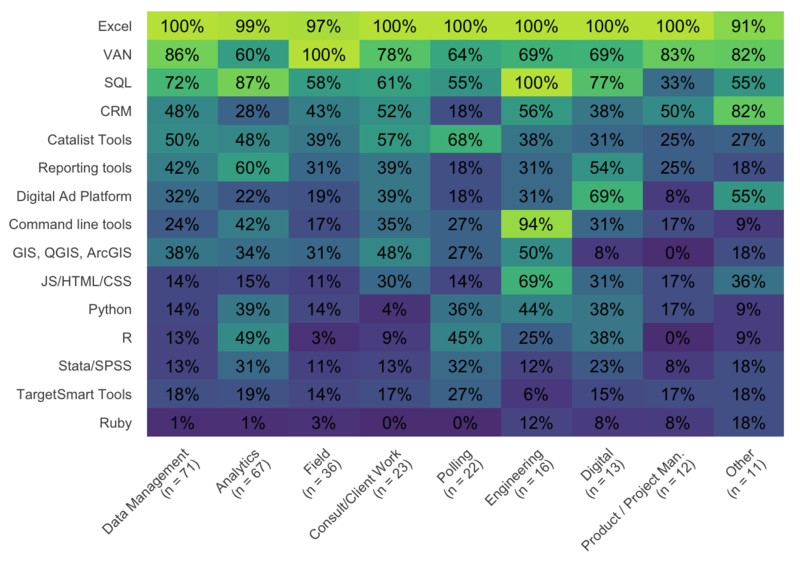 Is the primary focus (>40% of resources) of your team data, analytics, or technology? Is the primary focus (>40% of time) of your role data, analytics or technology? 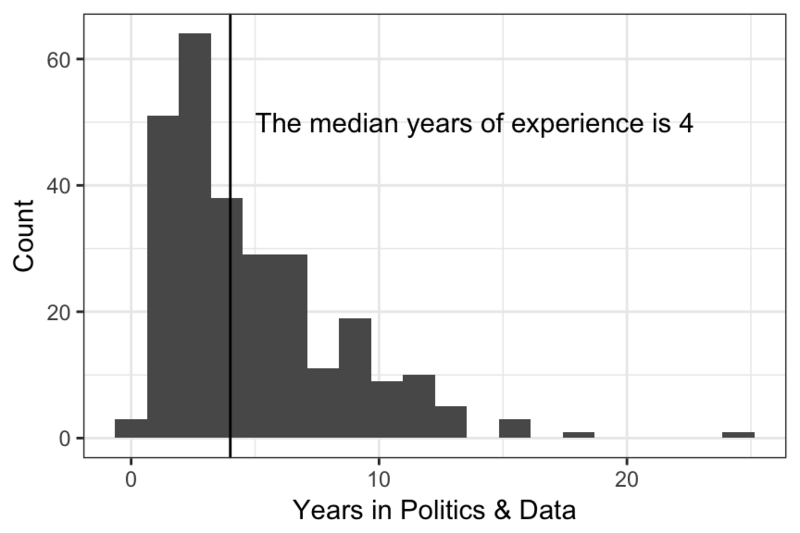 How many years of work experience do you have in progressive politics in data, analytics, and technology (i.e., how many years have you been a progressive data, analytics, or technology practitioner)? 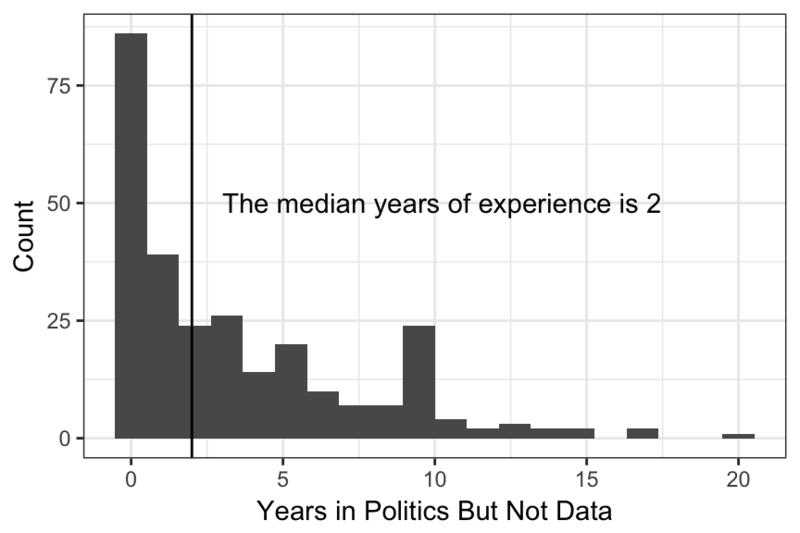 How many years of work experience do you have in progressive politics but not in data, analytics, and technology (i.e., exclude any years worked in data, analytics, and technology)? 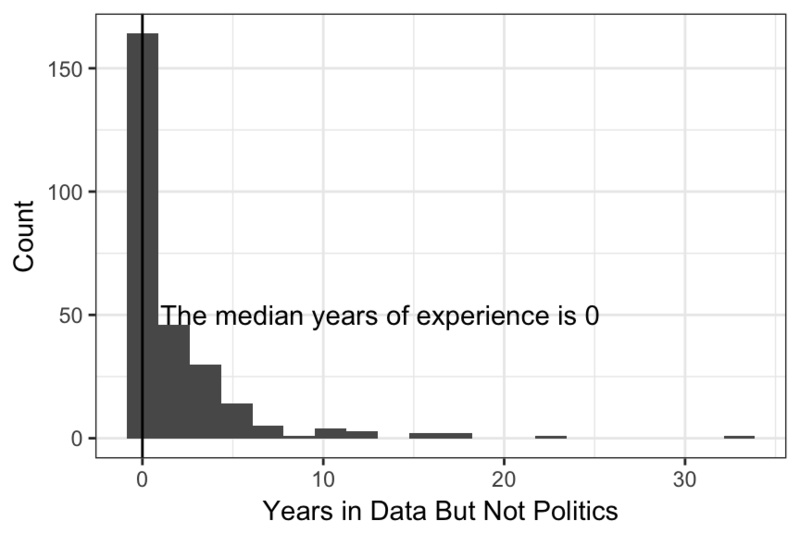 How many years of work experience do you have in data, analytics, and technology but not in progressive politics? 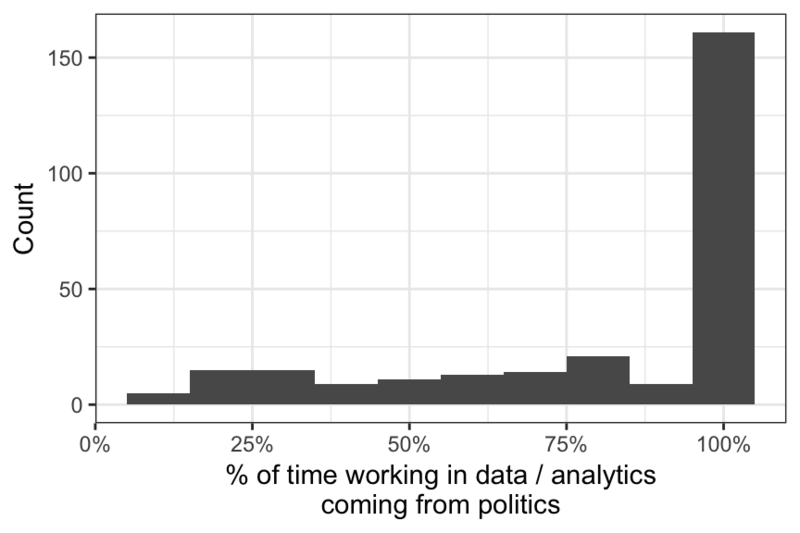 Most people’s experience in data and analytics comes exclusively from politics. How would you describe the organization? What is your primary job function? If in management, please indicate the primary job function of your team. How would you describe your level of seniority within the organization? How many full-time staffers do you manage? Please include everyone who reports “up the chain” to you, both directly or through layer(s) of management. 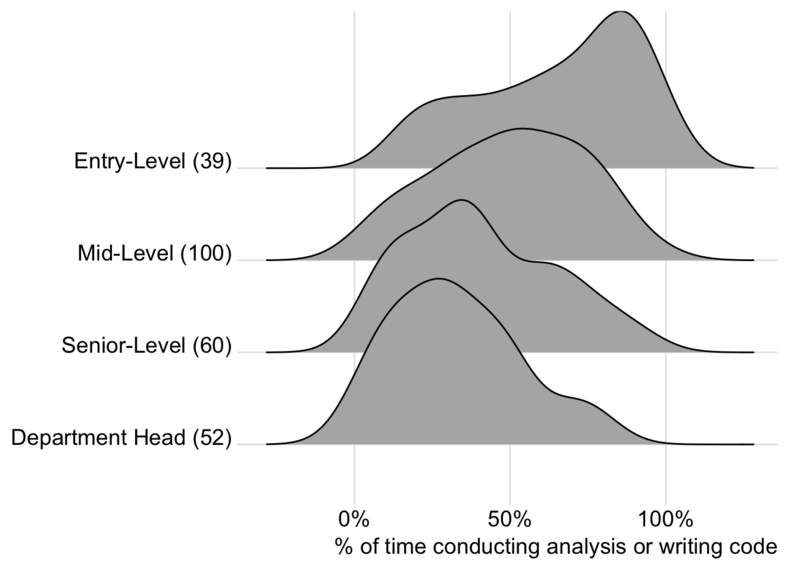 What percentage of your time do you spend directly conducting analysis or writing code — as opposed to, e.g., communicating with external partners or managing staff? 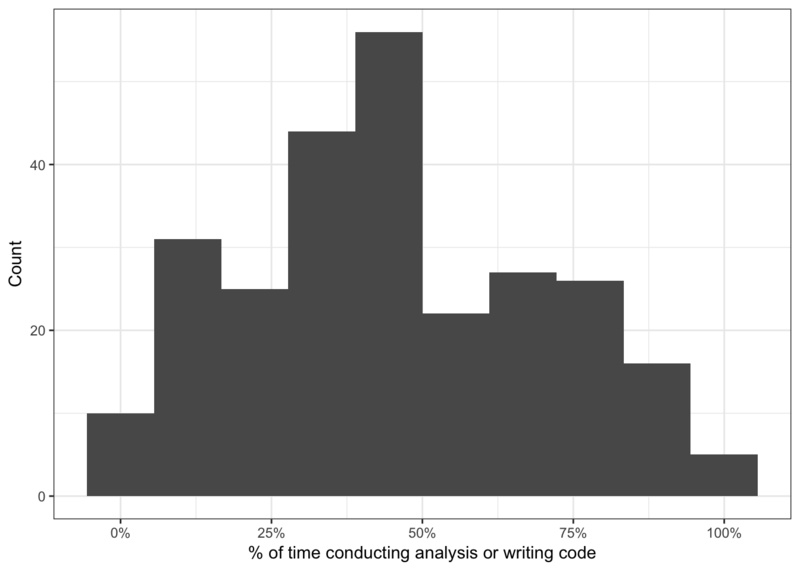 The mean percent of time spent writing code is 45.8%. The median percent of time spent writing code is 40.5%. Please describe the total expected annual pre-tax income, including bonuses or commissions. This figure may be salaried or unsalaried. The median salary is $70,000 to $74,999. For numeric analyses, salary was recorded as the midpoint of the interval. For those reporting salary under $20,000, the value recorded was $20,000, and for those reporting salary over $200,000, the value recorded was $200,000. Which of the following benefits are you personally eligible for? Select all that apply. Other benefits listed included travel benefits, bonuses / profit sharing, technology stipends, annuity and vacation funds, free food, a staff union, adoption support, and sabbatical. During your last job offer or performance review, did you try to negotiate your salary? What was % increase in compensation that you negotiated? You can also view negotiation outcomes by gender and race. How comfortable are you with the following tools? This graph displays the proportion of people who selected “Never used this before” versus any of the other options. This graph displays the full distribution of responses to skill level. Responses are ordered by the proportion of respondents who rate themselves as having intermediate or advanced skills. For more analysis on gender differences, please see the Appendix. Which of the following items have you personally done in the last year? Please select all that apply. Please describe any other major components of your work. Responses to this question included training, managing data tools and processes, explaining data and reporting to principals, research (both quantitative and not), database management, and client relations. In all of the following crosstabs, salary information is excluded for groups with fewer than 5 people. 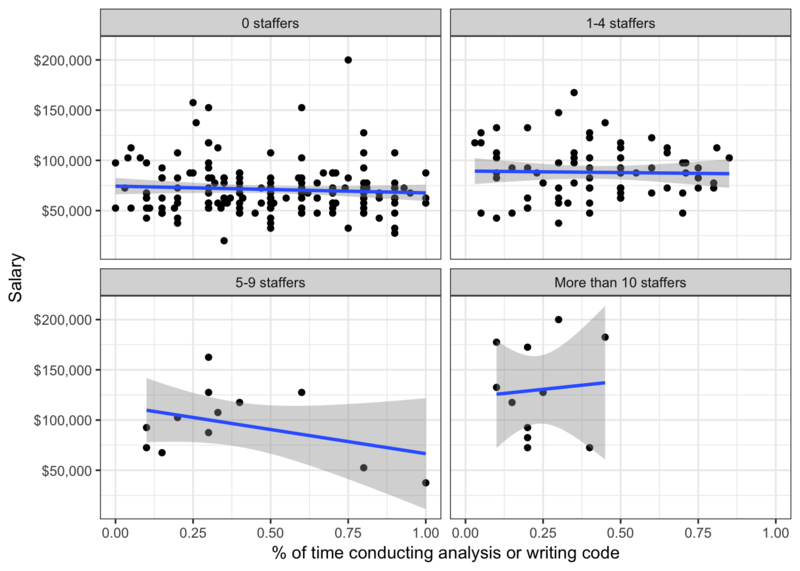 There is almost no relationship between percent time writing code and salary across management and job functions. For more information, please see the Appendix. 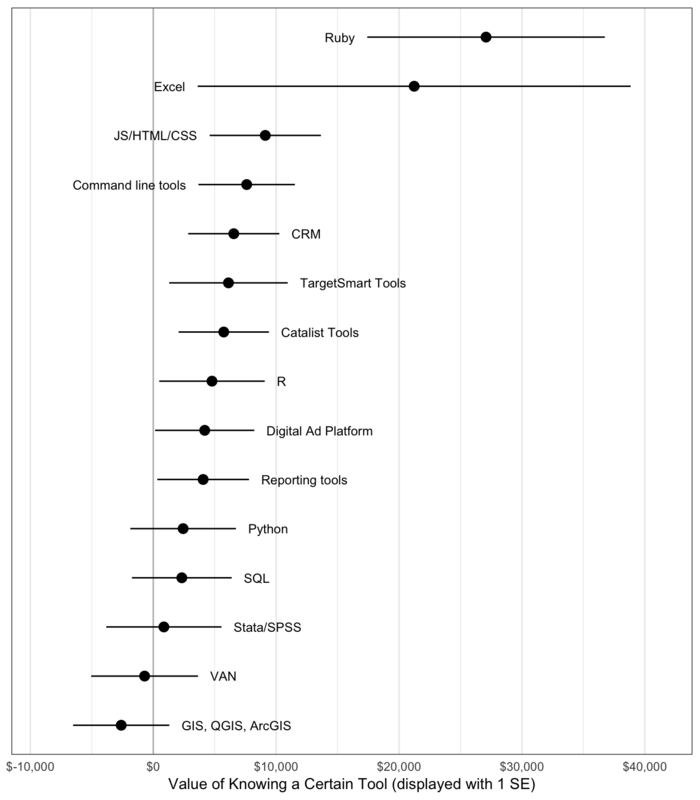 These graphs show the result of bivariate regressions of salary against a specific tool / skill. 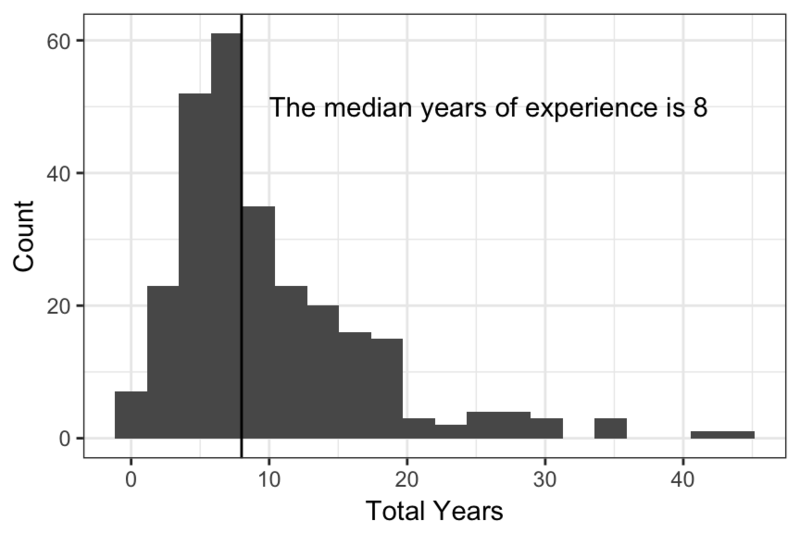 The point represents the predicted change in salary for knowing versus not knowing the tool / skill, and the line around it represents an interval of 1 standard error. Which of the following most accurately describes the next step you would like to take to advance your career? Please select all that apply. Write-in responses included wanting to work on a campaign, finishing school, rebuilding the union, growing an organization, leaving the US, and undecided. Note that some responses mentioned multiple topics. 161 respondents answered this question out of 273 total respondents. The proportions below display the percentage among those who responded. For a breakdown of these responses by gender and race, take a look at the Appendix. Respondents were only eligible to take this survey if (1) they worked in progressive politics AND (2) if their organization, role, or team focused on data, analytics, or technology. Do you currently work at an organization that either works in progressive politics or has some clients who work in progressive politics? Or, if you freelance, do you have some clients that work in progressive politics? If the answer to both was “No”, the respondent was not permitted to proceed with the survey. We received some comments that this design excluded individuals who left progressive politics or who worked in government. For those interested in government jobs, we recommend looking on government websites, where salary information is publicly available. 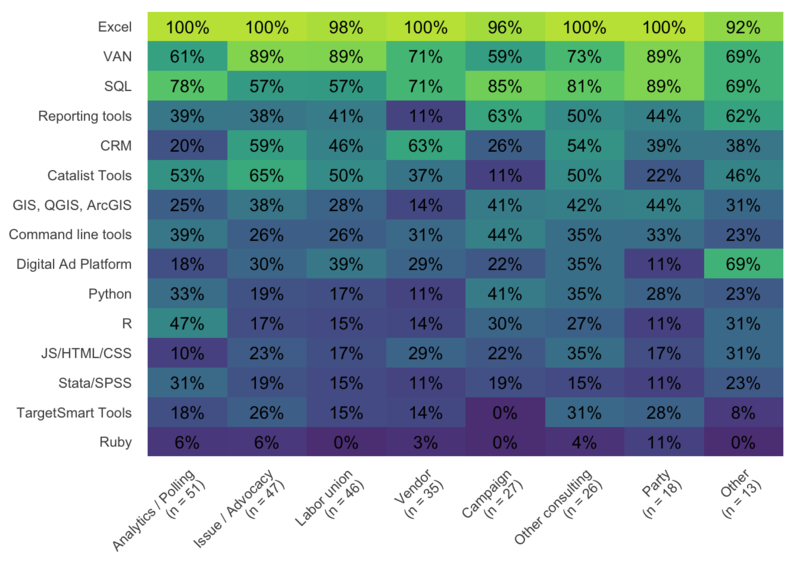 While the perspectives of those who left progressive politics are valuable for improving the field, they are somewhat outside the scope of this survey, and data on salaries in commercial organizations are available on sites such as Glassdoor. How did people receive this survey? A listserv? Their workplace? Other? This survey was hosted on Qualtrics. The data was analyzed using R, and this analysis was written using R Markdown using the flatly theme. 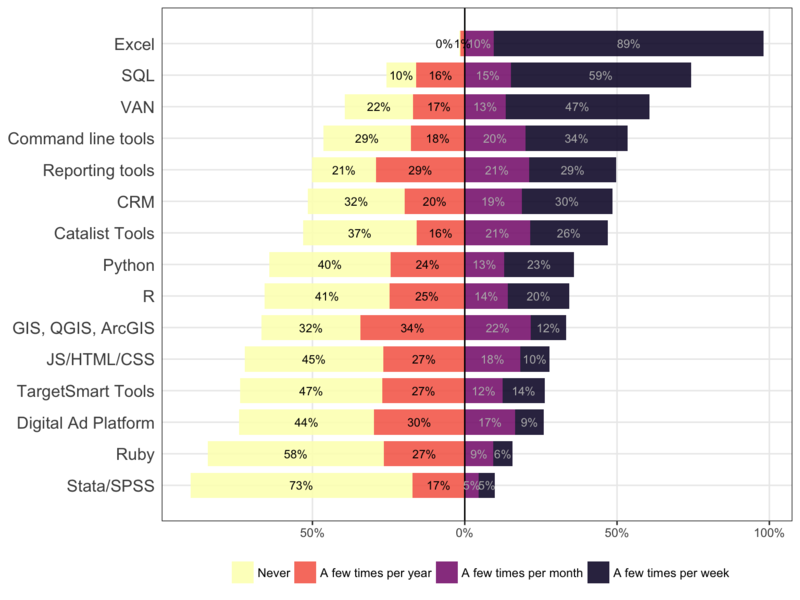 It makes heavy use of ggplot2, viridis, and formattable. There may also be some marginally gratuitous graphs made using ggjoy. This year’s salary survey was written and analyzed by Annie J. Wang, who can be reached at anniejw6@gmail.com if you have questions, comments, or concerns. I am grateful to the following people for reviewing and/or disseminating the survey (listed alphabetically): Amir Arman, Brett Benson, Bridgit Donnelly, Amanda Coulombe, Jenn Cervella, Kevin Collins, Anna Cooper, Will Cubbison, Kass DeVorsey, Jess Garson, Dessa Gypalo, Lara Helm, Amanda Hoey, Matt Johnson, Darren Kinnaird, Warren Linam, Jamie Michelson, Drew Miller, Amit Mistry, Nat Olin, Anupama Pillalamarri, Jonathan Robinson, Olivia Robinson, Michael Sadowsky, Cristina Sinclaire, Aaron Strauss, Susanna Supalla, Lena Tom, Tony Whittaker, and Victoria Yu. And the biggest thank you goes to everyone who took the survey! These tables display the proportion of respondents within a category who identified as Intermediate or Advanced in a skill. It turns out that across all skills and all tools, men are more likely to say that they have them. But are they as likely to actually have or use them? 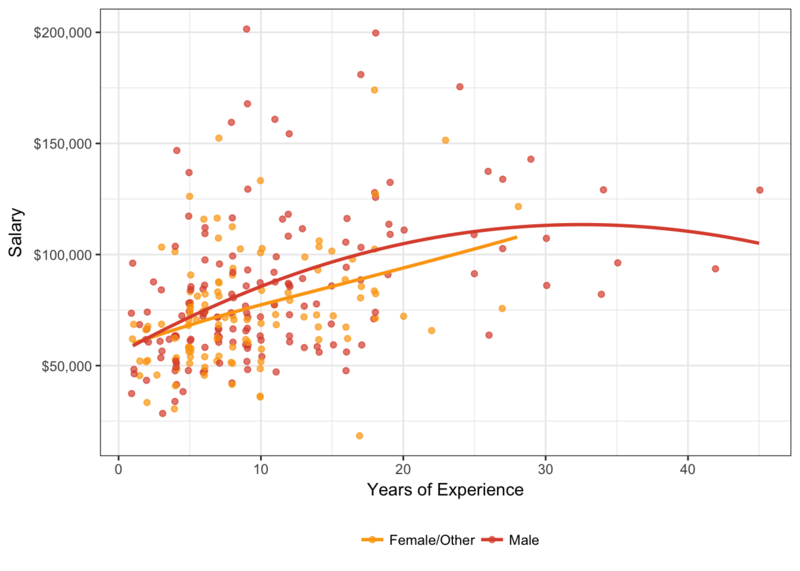 Across all of the statistics / programming tools that we asked about, a greater proportion of men than women rated themselves as “Intermediate” or “Advanced.” But does this mean that men are actually more skilled, or that they are more likely to rate themselves as more skilled? 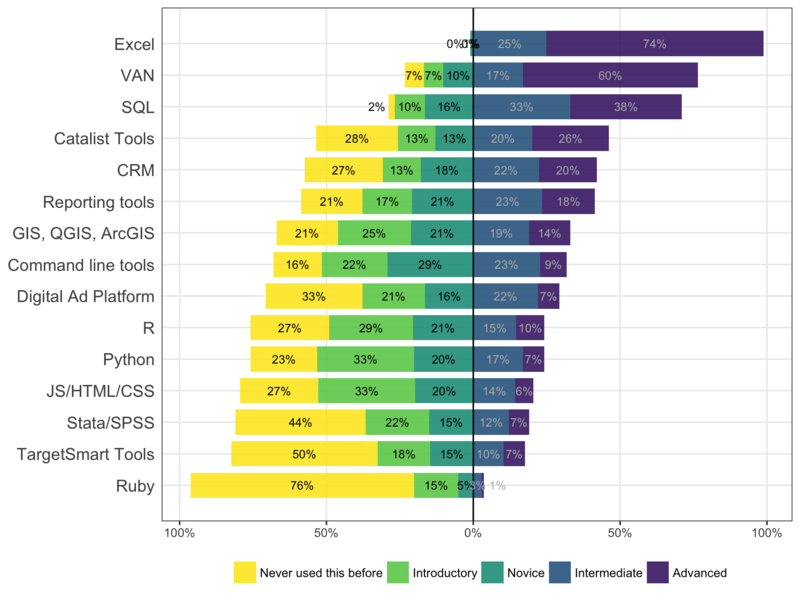 We couldn’t just administer a skills test on this survey, but we could ask how often people used certain tools as a proxy for actual skill level. 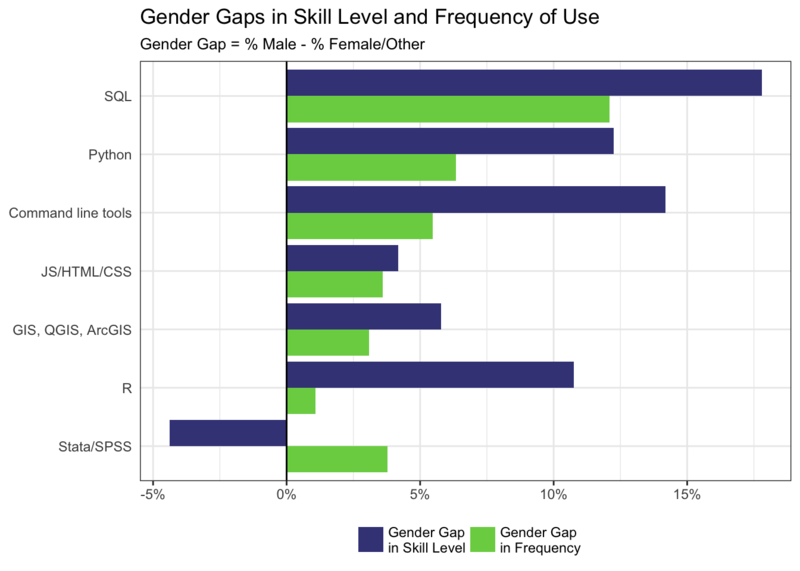 This chart combines both of those tables: turns out, the gender gap is a lot smaller when you ask how often people use certain skills instead of their self-perception of their skill level. One implication for hiring may be that it makes more sense to ask about the frequency of how people use certain tools or skills rather than a judgement of skill level. 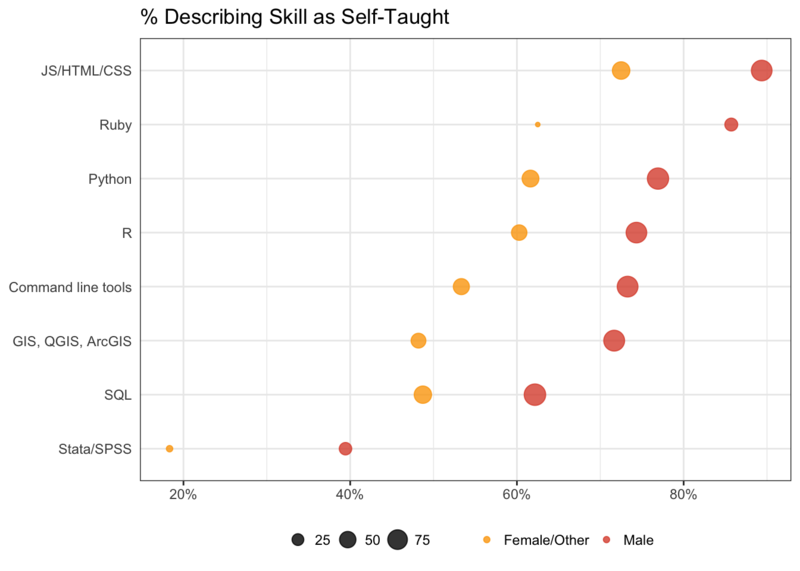 Across all skills, men are more likely to say that those skills were “self-taught” rather than “taught by others”. 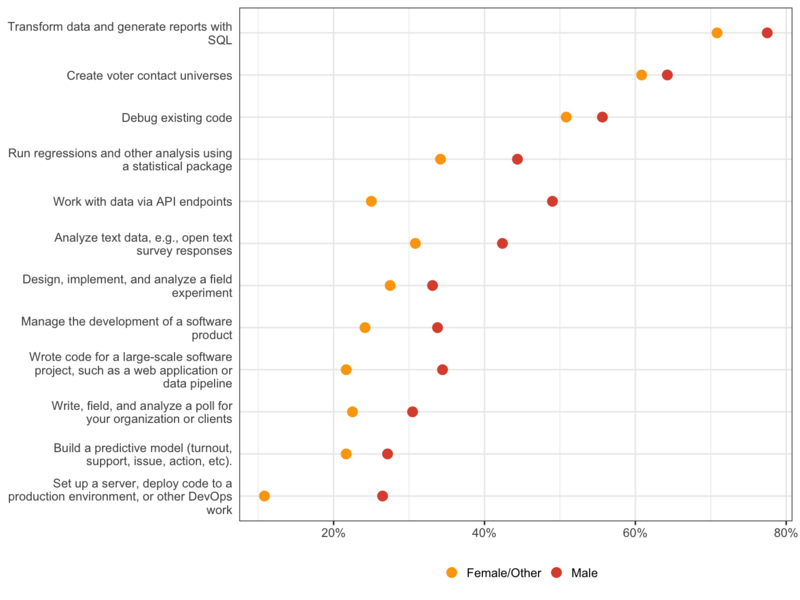 And yet, the gender differential on where those skills are acquired is much smaller. Similar proportions of men and women report learning those skills on the job versus at school versus neither. Is it the case that men are less likely to receive instruction at work, or are they just less likely to report that they were instructed? Across all skills … men are more likely to state that they have them, but some cases more so than others. While PhD-holders might have substantially different outcomes than BA-holders, it looks like Masters degrees are not particularly helpful. There is virtually no difference in BA-holders and Masters-holders in management status.